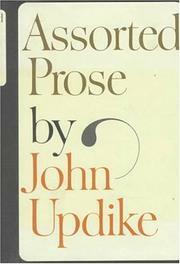 Updike, still in his early thirties, is probably the most gifted, certainly the most prolific, writer of his generation. In the mere space of five years or so, he has given us three novels, two collections of short stories, and two collections of poems. By even the most exacting standards, it is an impressive achievement. For our further astonishment he now presents the best of his occasional non-fiction pieces--book reviews, parodies, and various commentaries, mostly autobiographical, on the American scene, past and present. A good ideal, of the book has. appeared in the pages of The New Yorker, especially "The Talk of the Town section; this results at times", in a glossy blurring of Updike's individual voice, in slight, impressionistic bits about Central Park or the recent eclipse, etc., as well as a certain chic sentimentality. The essays on de Rougemont, Agee, crisis, theology, Nabokov; the Kerouac, Beckett, J. Donald Adams take-offs; and the memorials to President. Kennedy and Eliot are, however, sturdy, brilliant accomplishments, further reminders of Updike's dazzling versatility: the fine critical-mind the comedic talent, the moving, decorous eulogist.